Syfy continued its Sharknado franchise last night with Sharknado 5: Global Swarming, bringing back longtime franchise stars Ian Ziering and Tara Reid. 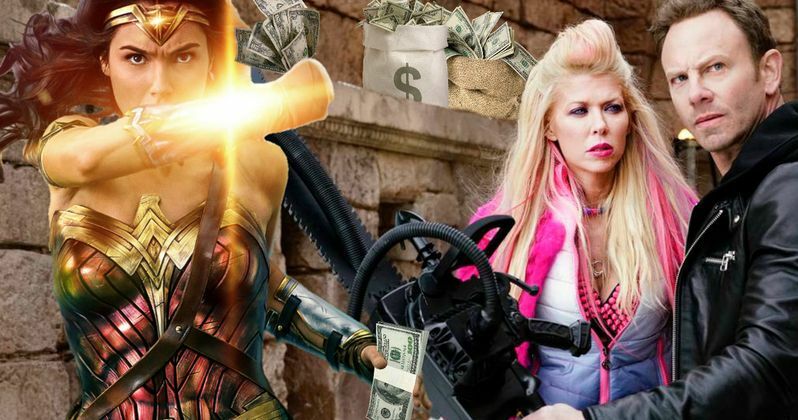 A new report reveals Ian Ziering not only made a lot more than co-star Tara Reid, but he also earned quite a bit more than Gal Gadot received for Wonder Woman. Ian Ziering reportedly took home a cool $500,000, with Tara Reid earning just a quarter of that salary. Ian Ziering's pay is also nearly twice as much as Gal Gadot's paycheck for headlining the second highest grossing domestic movie of the year, Wonder Woman. The Hollywood Reporter reveals that Ian Ziering's $500,000 salary represents roughly 17% of the sequel's $3 million salary, while the $300,000 earned by Gal Gadot on Wonder Woman represents just 0.2% of the movie's $149 million salary. We reported in June that the actress signed a three-picture deal, which she is now re-negotiating to get a much larger pack check in Wonder Woman 2, which was recently set for release December 13, 2019. Gal Gadot will be earning much more than just $300,000 for Wonder Woman 2, but how much more isn't clear at this time. The actress' contract with Warner Bros. included "huge performance bonuses," which are tied to the box office for Wonder Woman. Since Wonder Woman passed $400 million at the domestic box office this weekend, and will also likely pass $800 million worldwide at some point this week, it's probably safe to assume that the actress has earned some of these performance bonuses already, although there were no details on how much more she could potentially earn from Wonder Woman, if it keeps performing well at the box office. While Ian Ziering may have had a higher base pay for Sharknado 5 than Gal Gadot had for Wonder Woman, it seems likely that, in the long run, Gal Gadot will make out much better than Ian Ziering, who likely doesn't have the same deal in place. We recently reported that Wonder Woman director Patty Jenkins is coming back, and will likely get a pay raise herself, for Wonder Woman 2, with the director confirming that the new story is set in America. There have been reports that the sequel will be set in the 1980s, and that Chris Pine's Steve Trevor will also return. The original Wonder Woman movie was bookended by two present-day scenes, with most of the action taking place during World War I, and on Diana Prince's homeland of Themyscira. With the December 13, 2019 release date in place, that means it will arrive a few months after the Justice League sequel, which is slated for release on June 14, 2019. It seems likely that story will be set in the aftermath of the Justice League sequel, although no story details have been released at this time. We also learned last month that the original Wonder Woman, Lynda Carter, is in talks for a cameo appearance in Wonder Woman 2, and that they tried to get her in for a cameo in the first movie, but there were scheduling conflicts. She added that it would all be up to director Patty Jenkins, adding that if they could find an "organic" way to make her cameo work, she'd love to appear in Wonder Woman 2. Hopefully the actress' schedule would allow her to make a memorable cameo in this upcoming Wonder Woman sequel.